In one word, I am a bioinformatician. Currently, I am a research associate in Ponder and Markowetz' group, and trying to discover new things using lung cancer data. During my PhD, I devised cancer classification algorithms using gene expression data and also proposed some computational algorithms to identify disease-associated genes and drugs. I have interests in development of data mining algorithms with biomedical data to produce clinically actionable information. I would like to identify causes and development processes of serious and rare diseases. My ultimate research goal is constructing a medical decision support system with diagnosis and prognosis of various diseases. Hyunjin Kim, Youngmi Yoon, Jaegyoon Ahn, Sanghyun Park, "A literature-driven method to calculate similarities among diseases", Computer Methods and Programs in Biomedicine, vol. 122, issue 2, pp.108-122, 2015. Jihwan Ha, Hyunjin Kim, Youngmi Yoon, Sanghyun Park, "A method of extracting disease-related microRNAs through the propagation algorithm using the environmental factor based global miRNA network", Bio-Medical Materials and Engineering, vol. 26, issue s1, pp.1763-1772, 2015. Jeongwoo Kim, Hyunjin Kim, Youngmi Yoon, Sanghyun Park, "LGscore: A method to identify disease-related genes using biological literature and Google data", Journal of Biomedical Informatics, vol. 54, pp.270-282, 2015. Chihyun Park, Jaegyoon Ahn, Hyunjin Kim, Sanghyun Park, "Integrative gene network construction to analyze cancer recurrence by using semi-supervised learning", PLoS One, vol. 9, no. 1, 2014. Hyunjin Kim, Jaegyoon Ahn, Chihyun Park, Youngmi Yoon, Sanghyun Park, "A novel approach to predict prognosis of prostate cancer with inner-class clustering of gene expression data", Computers in Biology and Medicine, vol. 43, no. 10, pp.1363-1373, 2013. 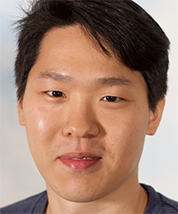 [Oral] Hyunjin Kim, Sanghyun Park, "Discovering disease-associated drugs using web crawl data", The 31st ACM Symposium on Applied Computing (ACM SAC 2016), Regular paper, Pisa, Italy, April, 2016. [Poster] Jeongwoo Kim, Hyunjin Kim, Yunku Yeu, Mincheol Shin, Sanghyun Park, "TILD: A strategy to identify cancer-related genes using title information in literature data", The 8th International Workshop on Data and Text Mining in Biomedical Informatics (DTMBIO"14), Shanghai, China, August, 2015. [Poster] Hyunjin Kim, Sanghyun Park, "A novel approach to detect disease-related genes using protein-protein interactions and literature-driven gene network", The 21st Annual International Conference on Intelligent Systems for Molecular Biology (ISMB 2013), Berlin, Germany, July, 2013.